The difference between inviting change and expecting change might seem straightforward, and whilst it is easy to say, actually making it a way of being, is somewhat more challenging. It requires practice and awareness, but the results benefit everyone. It is a journey of constantly reminding yourself about the principles of whether you are focusing on what is going wrong, or whether you acknowledge that things aren't quite as you would like them to be, and dwelling instead of how to help things go right. The pyramid of peace, as described by the book 'The Anatomy of Peace' illustrates the layers involved in developing this approach, with the underlying truth being whether you have a heart of peace or war towards a certain person or group of people at that point. It is a great book and certainly worth a read.... devour it and become the change you want to see in the world! There is nothing wrong about wanting others to change, but if "dealing with what's going wrong" doesn't work, it is usually because we have been doing it at the expense of helping things go right. 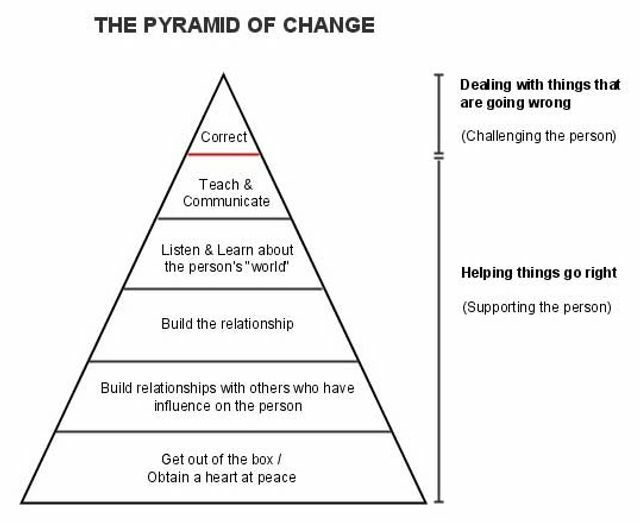 As the pyramid diagram shows, in order to invite change, helping things go right is the biggest part of the work. There are several parts to it, and that's where we need to spend most of our time and energy. In simple terms, it is to say that we have more chance to invite change in someone if we approach her without resentment, if we have built a relationship with her and her friends/family, if we have listened and learnt from her, and if we explain clearly the change we want to invite. Is that really surprising?